A year ago I got a diagnosis of pre-diabetes and obesity. No problem, I thought; I can just go back on a strict Paleo diet and all those troublesome blood test results, and the blood pressure that is stubbornly on the edge of low-grade hypertension will wind back down as they did the last time I cleaned up my food. Starting a ketogenic diet was a good thing. Withdrawal from carbohydrates was a bad thing for my blog. Fast-forward to June (last month). I was having blurred vision, and phantom pain in my feet. My rheumatoid arthritis was out of control. I was afraid to check my blood pressure because I knew damned well what I would find. And the scale was not my friend. I refuse to take up the crown of the Queen of Denial (that was my mother), but I certainly deserve the title Silver Dragon, Princess of Denial. So at the end of June I started a ketogenic diet, based on the guidelines I found at Nerdfitness. The idea is to deliberately put your body into ketosis, a state in which it runs using fat rather than glucose as its primary fuel. 30 net grams of carbohydrate (carbs), tops. 70+ grams of protein a day, add fats to reach target calories per day. I eliminated gluten. I eliminated grains. No starchy stuff, not even yams. No fruit—the carbs are all veggies. The one thing that keeps my current food from being ancestral is cow milk products, and I’m working on getting those out of my foods as well. 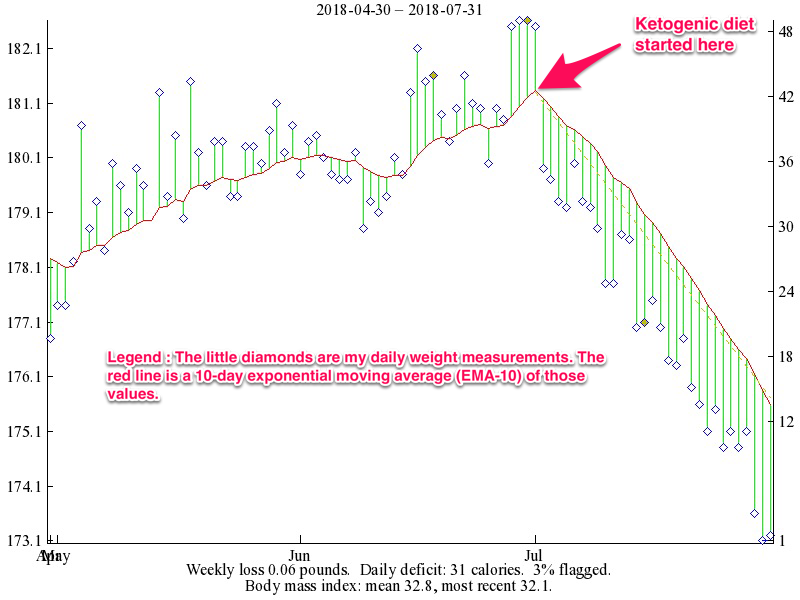 This came at a cost; for the first two days I was sick with diarrhea, and I spent the subsequent two weeks in the notorious Keto Brain Fog, also known as carbohydrate withdrawal. Yes, it’s a thing. Blogging under those conditions proved impractical; I have two half-finished posts in the queue. They will remain half-finished, because they are as foggy as my brain was. I’ve accepted that it’s likely that I will be on a ketogenic Paleo diet indefinitely. This is not a hardship. Going back to the symptoms above—that would be a hardship. Further, moderation and I do not seem to get along. Once I start expanding what I can eat, I don’t seem to be able to stop. I can live with that. I don’t want to get into religious wars about this. Not everyone wants to even try a ketogenic diet. Others will be convinced that I (or they) would be better off with a less-restrictive food plan. I’m certainly not trying to convert anyone! It’s just my experience. Apply it to yourself at your own risk. The Paleo Solution by Robb Wolf. The original text I used to switch to an ancestral way of eating four years ago. Details of how to eat ancestrally without being dogmatic, and a lot of nutrition research references. Wired to Eat by Robb Wolf. Robb adjusts his recommendations (!) based on ten years of new research in the nutrition field. He has an entirely new chapter on why, how, and whether to start a ketogenic ancestral diet. Again, research references abound. Site owner Steve Kamb provides a lot of information on diet and exercise. He also discusses ancestral and ketogenic diets (which are NOT mutually exclusive) in an easy-to-understand and humorous way. I don’t know about you, but none of this works for me without actually keeping track of what I eat. All of it. You can do it with pencil and paper, but why? MFP, despite the obnoxious ads, is the service that will connect with the most other services, has apps on all the devices, and a huge nutritional database. My warning: be careful which version of, oh, onions (for example) you log. Some have fiber grams listed and some don’t. In order to know your net carbs, you have to know the fiber content.